It’s so exciting to see weddings take on personalities of their own with creative design elements. 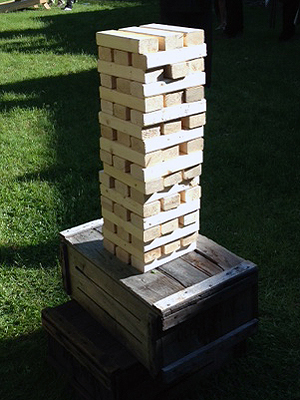 Here’s a fun idea from a recent Elm Bank wedding for those who want to think outside of the box for their wedding entertainment: outdoor games. 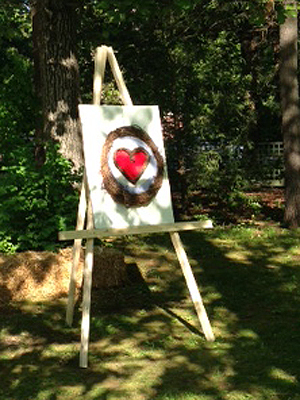 The father of the bride and the groom built a giant Jenga game and also created a customized dart board with a heart-shaped target. The wedding guests enjoyed being out in the gardens and getting their competitive juices flowing. This relaxed vibe added to the casual feel the couple wanted for their special day. Gone are the cookie-cutter weddings of days past. Long live creativity! What fun games have you played at a wedding? Let us know in the comments below. For more creative wedding inspiration, check out our Pinterest boards or visit our Wedding Cake site. Our menus at Pepper’s Fine Catering are always evolving. 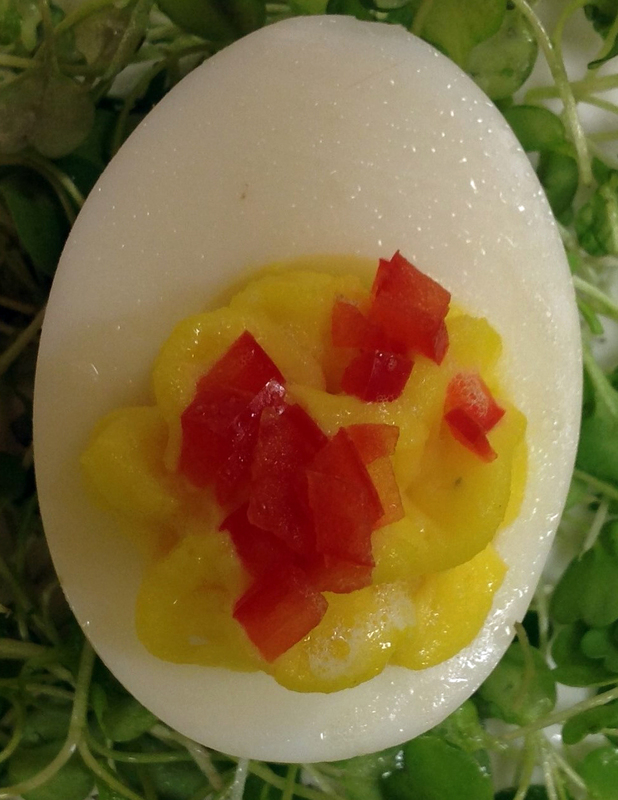 We recently debuted a new station, Deviled Eggs. 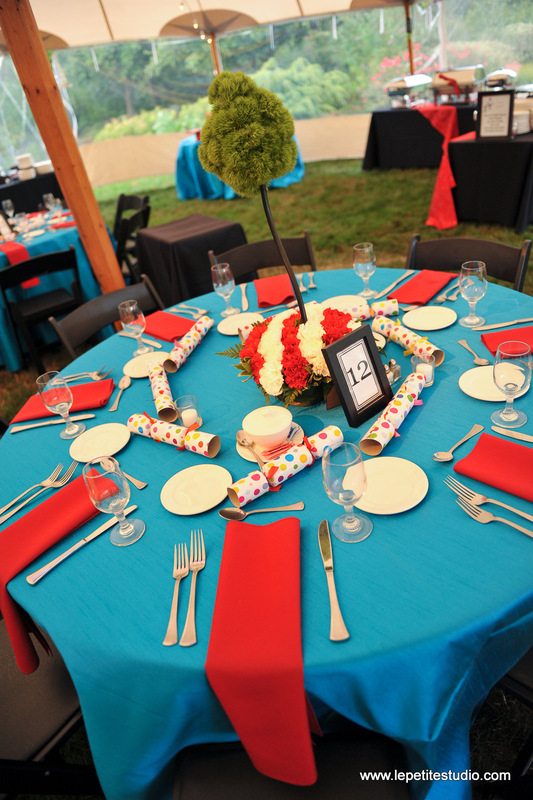 This was the brainchild of Senior Event Planner Jody Boyajian. During frequent trips to D.C., her family often patronizes a local hotspot called The Founding Farmers where the first thing they order is a platter of deviled eggs. 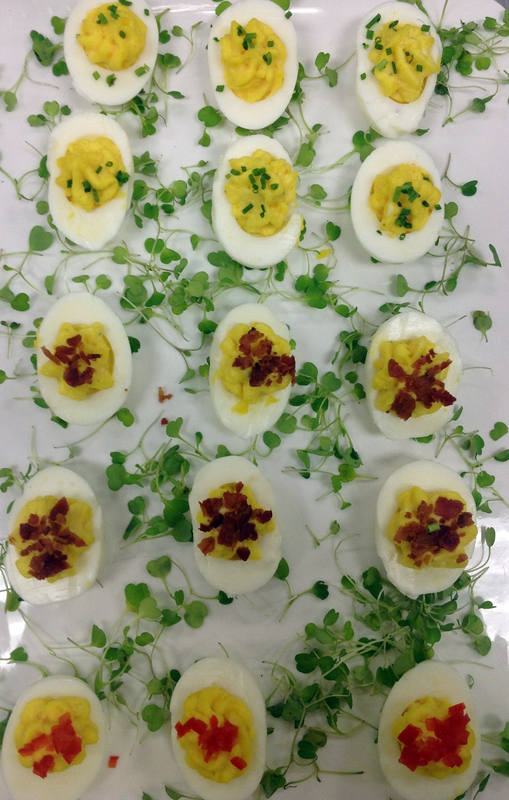 She brought the Deviled Egg Station idea to the attention of the culinary team who added their twist with flavors like Buffalo and Sour Cream & Chives. She then sold the concept to two customers with corporate themed parties. One of the more recent events was for an Audi Vehicle Debut Party, located at a Boston area car dealership. The client’s ideal design was for an upscale, sleek, modern and night-club aesthetic. Their chosen colors were shiny red, silver and gold. 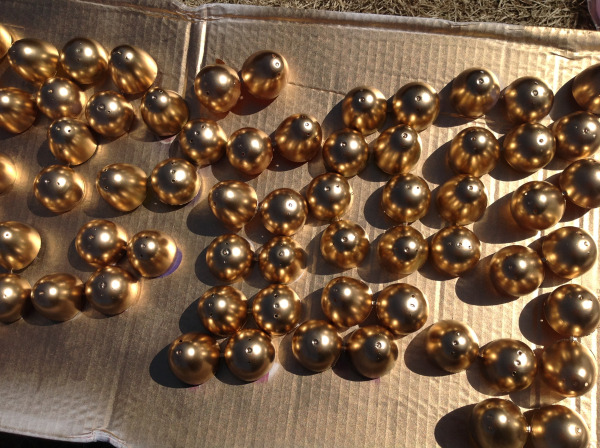 To achieve the look we started with spraying eggs metallic red. The light bulb went on for added glitz. 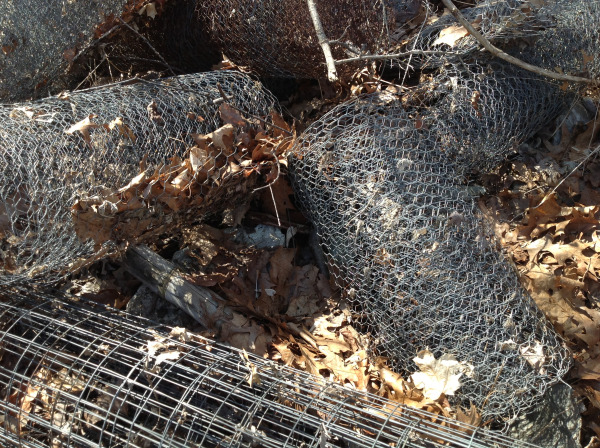 Rolls of chicken wire behind one of our storage buildings would frame our vessels. 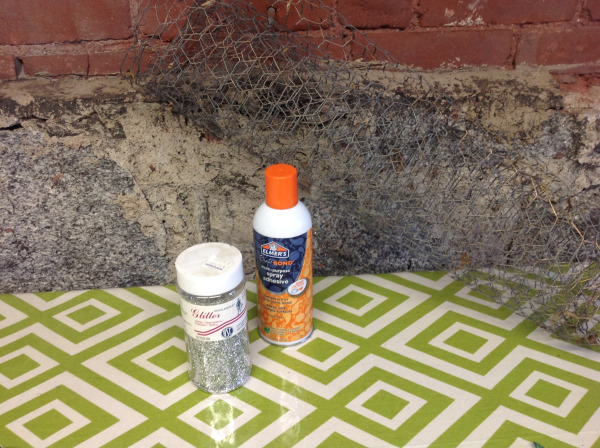 Old tarnished wire was sprayed with adhesive and coated in silver glitter. 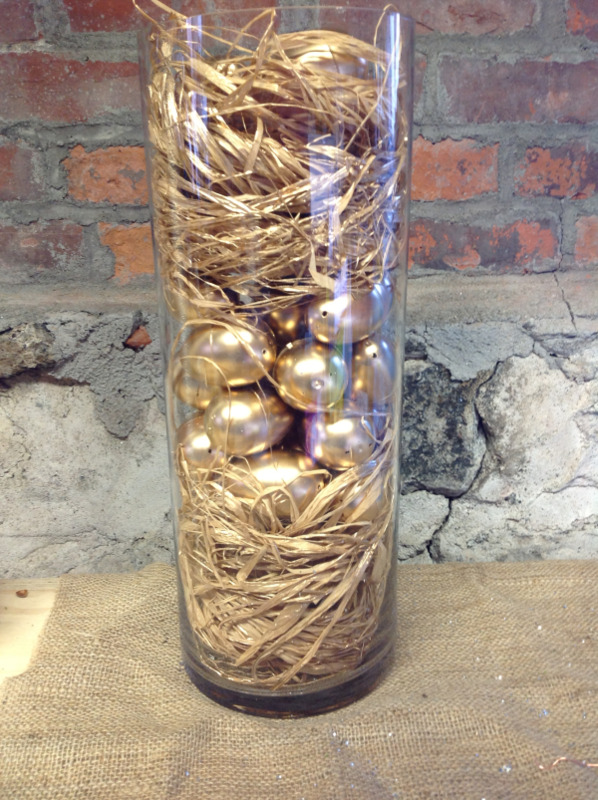 10 dozen plastic eggs were sprayed gold. 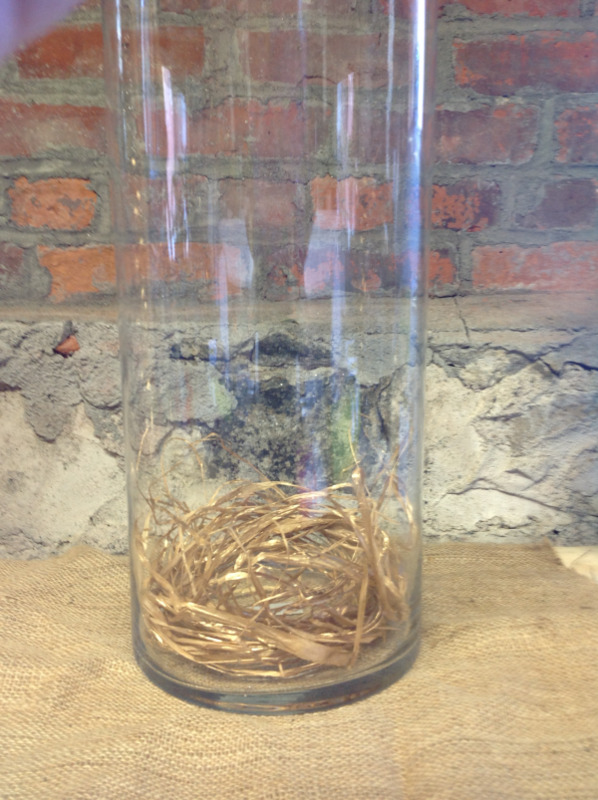 Raffia/Hay was sprayed gold and added to the bottom of the vessel. One vessel was layered with Hay and Eggs. 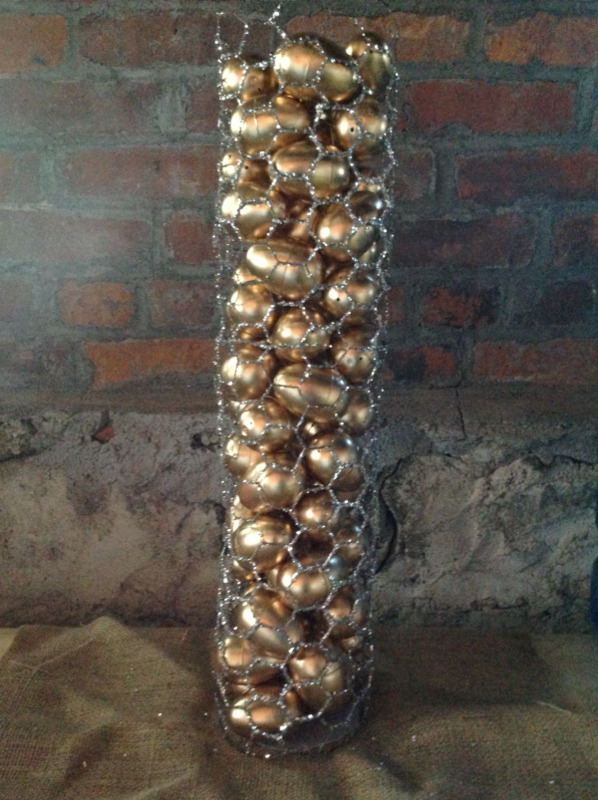 A glittered chicken wire column was filled with eggs and the slipped into a glass vessel and then addedto the Deviled Egg Stations for that finishing touch. We recently had the pleasure of working with high-end Yoga and Fitness Apparel Company Lululemon to take their vision for their customer appreciation event and bring it to life. 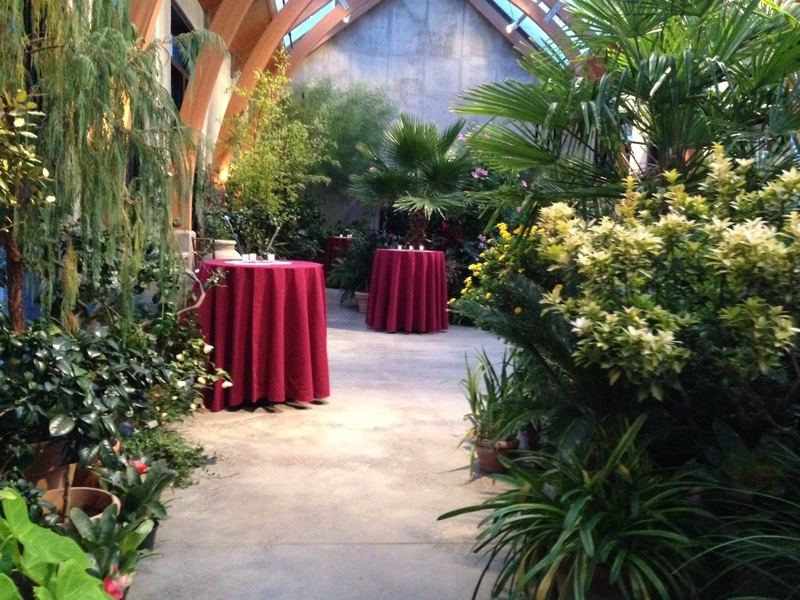 The exciting event took place at the Tower Hill Botanical Gardens, the perfect setting for a rustic fall garden look. After the guests enjoyed yoga in the open air great hall they made their way into the reception room to be greeted by staff members presenting fun and healthy appetizers. Guests also got to snack on granola from the Granola Bar. They could choose from Homemade Cinnamon Sugar Granola or Chocolate Chipotle. All accompanied by various nuts and candy mix-ins. The Granola Station was truly a hit! 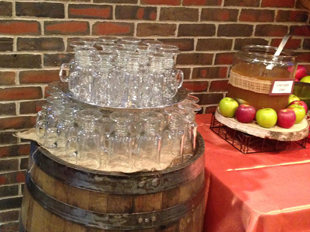 A Cider Station provided the beverages for the evening. Offering both cold and hot apple cider served in Irish coffee mugs. Wine Barrels provided a unique table to display the glassware for the station. Note:These can be rented from Peterson’s Rental Company. 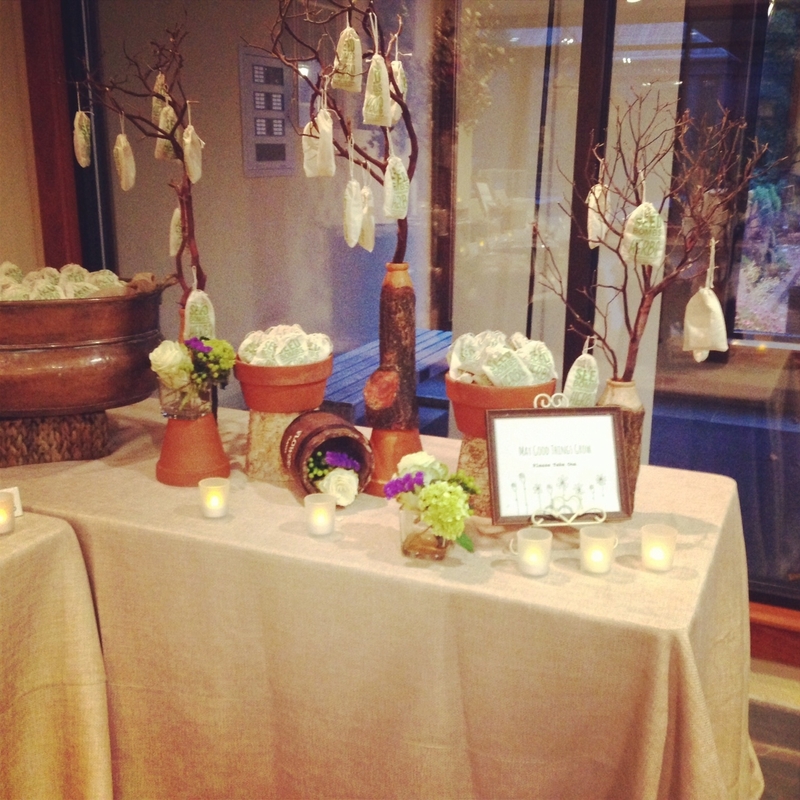 Before guests departed for the night they took with them Seed Bomb Favors presented on hanging branches by the exit. Pepper’s had another great event on Saturday! Working with repeat clients is always a pleasure, especially when our staff is allowed some creative freedom in putting together an event, and Saturday was no exception! 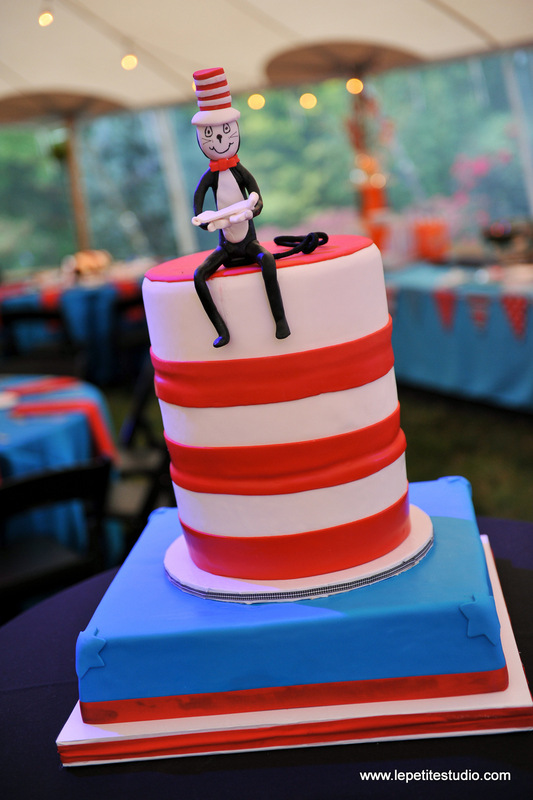 Saturday’s event was a Bar Mitzvah with a Dr. Seuss, 'Cat in the Hat' theme.As many of you can imagine the topsy-turvy world of Dr. Seuss brings out the inner child and imagination of everyone. 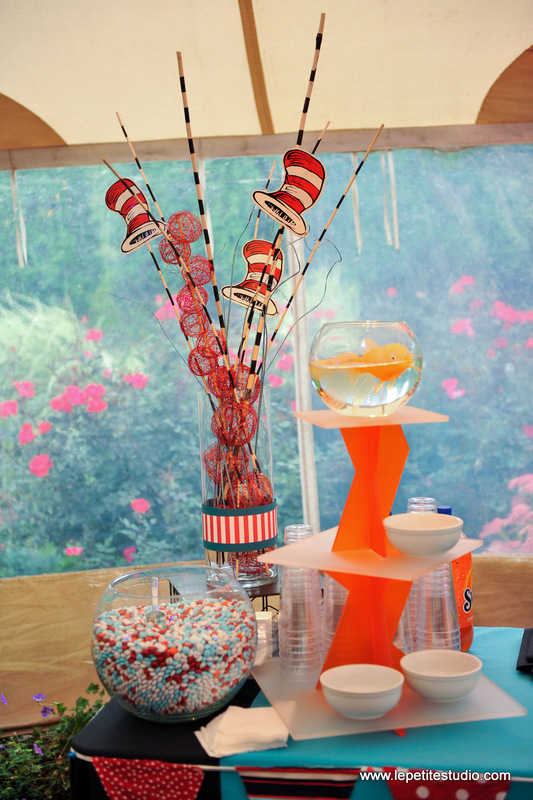 For the event, we at Pepper’s wanted to ensure that the playfulness of Dr. Seuss was evident, but also had a refined, understated look that went along with the Client’s needs. The end result was a bright, beautiful scene which had class, and the playfulness one would expect from Dr. Seuss. Our team at Pepper’s is always looking for ways to stretch our imaginations and bring a client’s vision to life, and I think our Cat in the Hat evening was a great success! At Pepper’s Fine Catering, we have the pleasure of continually developing custom, creative menus for our clients, as each and every event is unique. Some of our parties have themes, and as true culinary artists, our Chefs have put together some terrific catering menus for such special events. Keep in mind, just because a party has a theme, it doesn’t necessarily mean you have to wear a costume (but that didn’t stop us, clown noses anyone?) Success can be achieved easily with some simple and tasteful themed décor, creative menu planning and some of our favorite catering recipes. 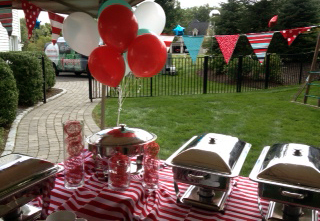 Recently, we had a client who was throwing a Carnival Themed Birthday Party for her daughter’s 6th Birthday. Together with our Chefs and Style & Design department, we put together a fabulous event with fun décor that didn’t break the bank. The menu was simple and delicious, incorporating Carnival Themed Food with some heartier options to appease all palettes. Remember, themes can come from anything—movies, culture, television, eras and trends. Just about anything that interests you or the guest of honor can make a great theme. So have fun and let Pepper’s help you plan a terrific themed catering menu for a memorable event. I started cake decorating using the technique of brush embroidery when it was coming into style. As with many techniques, it was very popular for a few years and then faded away. Imagine my surprise when a bride came to my tasting with a picture of a lovely embroidered cake. Hooray! The technique is somewhat time consuming, as you can see by the pictures, but the end result is very delicate and duplicates the look of needlework, a favorite hobby of mine. 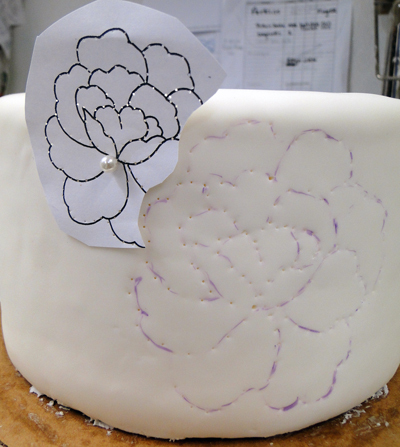 The flower is etched onto the cake using a paper pattern. I use a pin to outline the pattern. 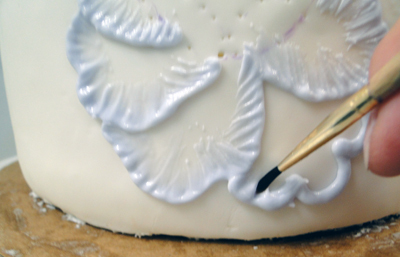 Royal icing is piped along the outline and pulled into the center with a damp paintbrush. If you want additional depth you let the first layer dry and repeat. This cake incorporates the brush technique with copious, fun miniature butterflies in a swag pattern. The lavender shades really compliment the stark white of the fondant. 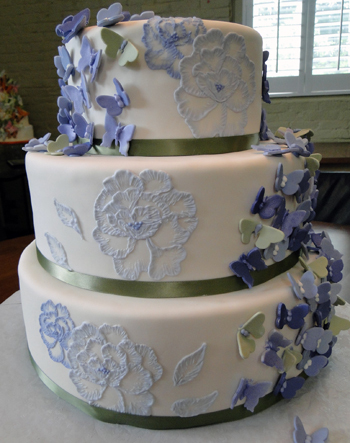 The final result is a lovely elegantly designed cake. 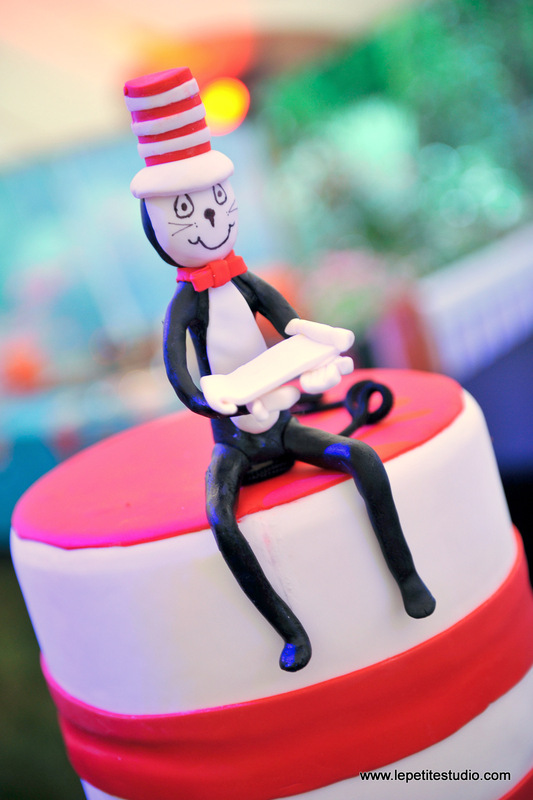 To see more unique and creative cake designs check out our CakeART gallery page. 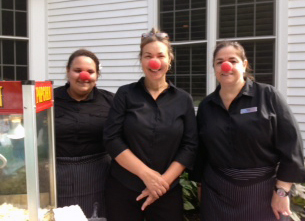 Pepper's Catering is Serious About Volunteer Work! As we celebrate our 25th year in business, we spend a lot of time reflecting on the many pieces that make up the Pepper’s Pie. We’ve created and worked thousands of fabulous events over the years, including everything from baby showers and weddings to large scale galas. We understand that every single event is important and unique, which is why we put our very best into creating memorable experiences for hundreds of thousands of local community members. 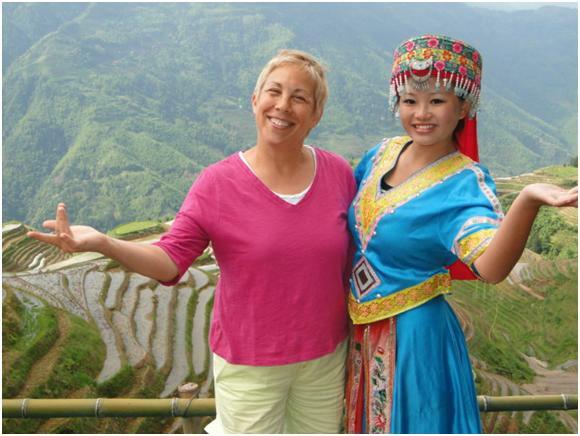 The diversity of our jobs and clients positively affects every member of the Pepper’s team. By working closely with so many different people, we have come to value our community and pledged to work hard to strengthen it. At Pepper’s, we remain committed to supporting many local charities, by donating our cuisines and resources to both non-profit and community organizations. Over the years we’ve supported Massachusetts Veteran’s Inc, Worcester County Food Bank, Big Brothers Big Sisters, Rachel’s Table, Dress for Success and Shrewsbury Youth & Family Services, among others. 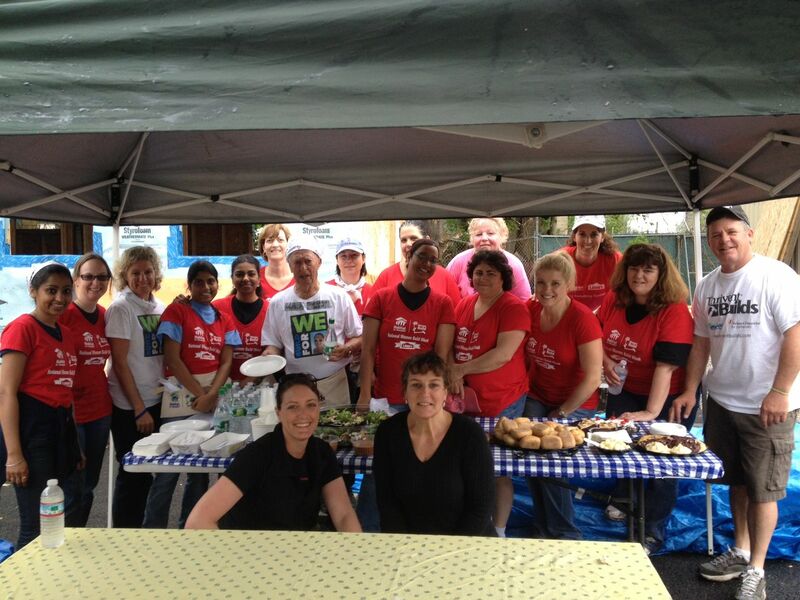 This past week we dropped off a healthy and delicious lunch to the “Women in Build” group of volunteers who were helping build a home with Habitat for Humanity in Lowell, MA. We take pride in working with these groups, knowing that we’re connecting with our community to make it a better place. The satisfaction received from making a difference is absolutely priceless. We look forward to continuing our commitment to the community through our volunteer work with you. 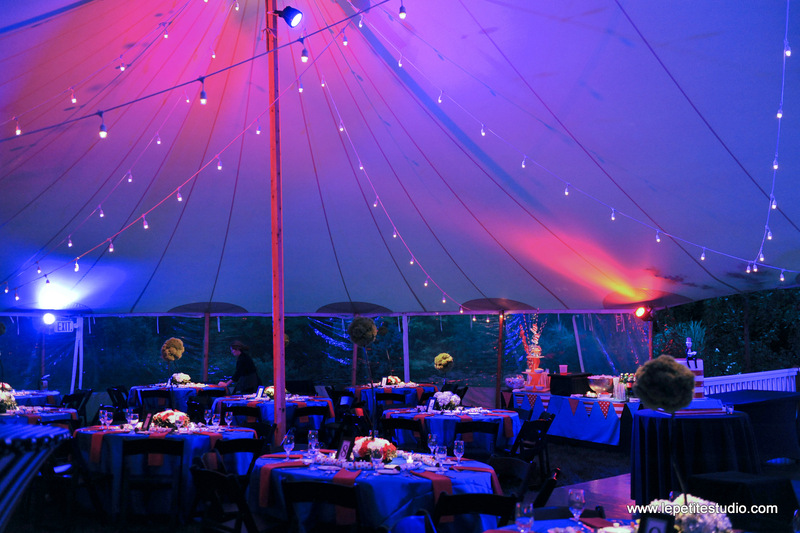 Last weekend we catered and designed the biannual spring gala event, “Above and Beyond” for 250 of Worcester Academy’s parents, faculty, alumni and friends. It was held at a new venue of ours– the Cotsidas Hall at St. Spyridon’s Greek Orthodox Cathedral in Worcester, Massachusetts. Although the event was inside, we couldn’t have been luckier with the weather, it was a beautiful spring day for an auction! In a nod to spring and the freshness it brings, Pepper’s created a beautiful and happy atmosphere using décor of yellow and white monochromatic linens, white whimsical chair covers, and tables adorned with mercury glass vases. The vases held springtime flowers, designed and prepared by volunteers from Worcester Academy. The bars announced springtime with huge bouquets of forsythia, a popular early spring bloom. The décor was enhanced by the tactful lighting. White draping on the walls set the backdrop for the audio visual projection of the live auction items provided by Shoreline AV. The evening began with guests being invited into the cocktail hour to view and bid on silent auction items, while enjoying the event’s signature drink—a lemon drop martini, as well as an array of passed hors d’oeuvres. Following the excitement of the live auction led by the Zekos Group, Pepper’s Catering served an entrée of rosemary crusted beef tenderloin with bordelaise sauce served over roasted vegetable couscous, or a roasted vegetable stuffed zucchini and tomato herb ragout. After dinner, doors opened and guests were welcomed to the grand finale. They were overwhelmed! The added bonus was the to-go offering of any dessert that had not been eaten. What a night! It was the perfect celebration from beginning to end—a financial success for Worcester Academy, a culinary delight for guests, and a great experience for Pepper’s to work at a new venue. If you’re considering an event that requires a venue, either large or small, the Cotsidas Hall could be the place. Contact Pepper’s for more details. It seems like we have been doing Dessert Buffets here at Pepper's Fine Catering, well forever. 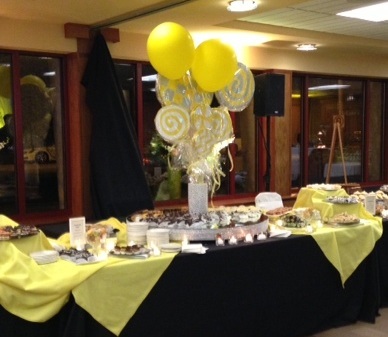 When we first began serving desserts buffet style, we weren’t sure what to expect. But soon after we started, we noticed a growing interest in Dessert Buffets, and we knew it was time to give them the kind of menu makeover that would make the interest even greater. When choosing desserts for each station, everything including the color, flavor, and size of each dessert must be taken into account so that they fit in with the rest of your party. Each dessert at Pepper's must pass the taste testing staff’s approval of deliciousness to earn a place on the menu, and they can be harsh critiques! 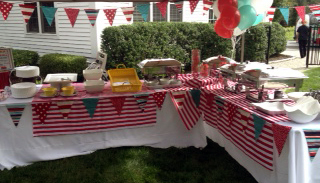 There are many benefits to having a dessert buffet at an event or party. If you're holding a large function, they're great guest pleasers. Your guests will enjoy the option of more than one dessert and will be able to move about, schmoozing after speeches or meetings. This goes for weddings, too! Rather than going with the traditional wedding cake, a dessert buffet can add a unique touch and a variety of flavor. 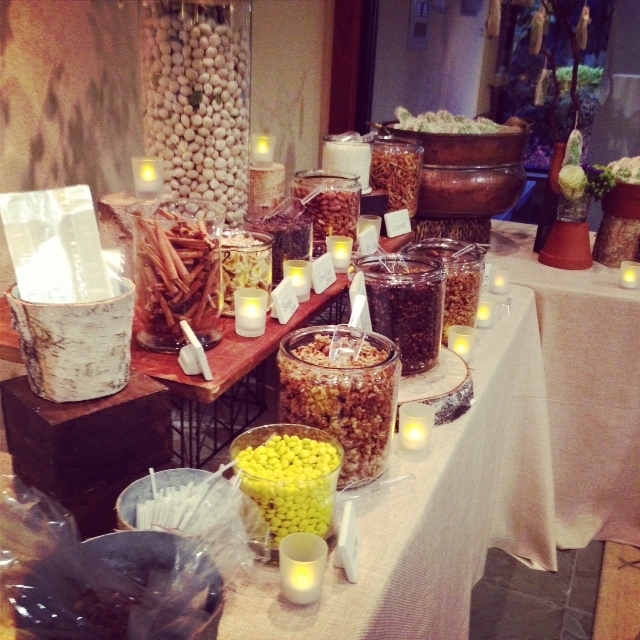 Almost anything can be included in a buffet: from simple desserts like brownies, dipped fruit, and cookies, to the more sublime--dessert custards, seasonal mousse cups, and unique mini sweets. Over the past year I have experimented with our items and am now offering four buffet options. Each is given their own name, all with delicious foods included. 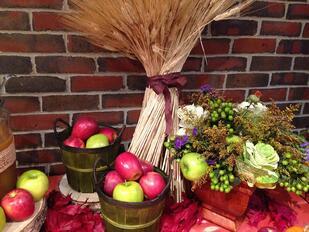 Recently we catered an anniversary event for a local company hosting their top customers. 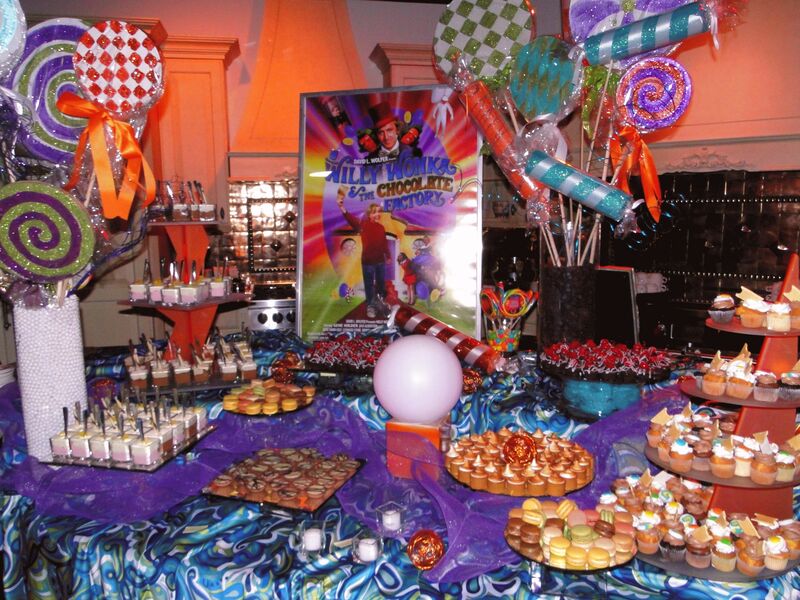 They chose "1970s Movies" as their event focus, and we went wild creating a Willy Wonka dessert experience for their dessert buffet. 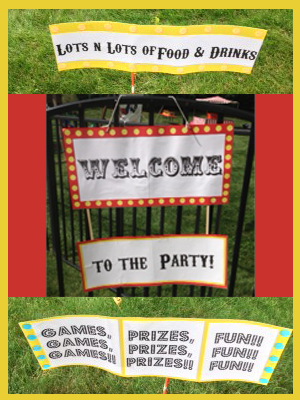 We had so much fun with our golden ticket garnish for the cupcakes and our giant lollypop props. The design perfectly evoked the whimsicality of the movie and the DayGlo colors of the 70s set. The best looking part was definitely the 15 pounds of chocolate in one of the display vases! If you're curious to see more of our work, take a look at some of our dessert pictures and check out our Dessert Buffet Menu online as well. Happy eating! For years my close friends and associates have tolerated my rants about eating locally grown foods, understanding that it goes way beyond being trendy or simply supporting a local business. My occasional waxing prophetically about eating what is grown, caught and produced locally is about taste and taste alone. Recently Pepper’s has committed to offering only Murray’s Chicken to our clients. Murray’s Farms are located in New York and Pennsylvania. Each farm is committed to not using growth hormones or any type of antibiotics. This great care makes Murray’s Chickens particularly moist, and they taste delicious. So where am I going with this? What do Murray’s locally raised chickens and rice have in common? Last evening my wife and I had a hankering for Asian food. We debated ordering sushi or getting takeout. But it was Monday, and fresh fish is generally not so fresh on Mondays. Okay, what next? Cook at home of course! A quick shopping trip brought some fresh petit Asian eggplant, lemongrass, bok choi, Chinese long beans, ginger, cilantro and a really good looking piece of D'artanian Smoked Duck. We figured we would make some simple rice to go along with the dish that’s taking shape. Combing through the cupboards revealed that we were out of rice, with one exception. We had been saving a bag of rice that was given to us from a local woman from the rice terrace area of Longsheng, a region of China near Gullin. There’s a long story behind how we came upon this modest ½ lb. bag of rice, but in the interest of brevity let me just share that the indigenous residents of this area have been growing rice pretty much the same way for thousands of years. 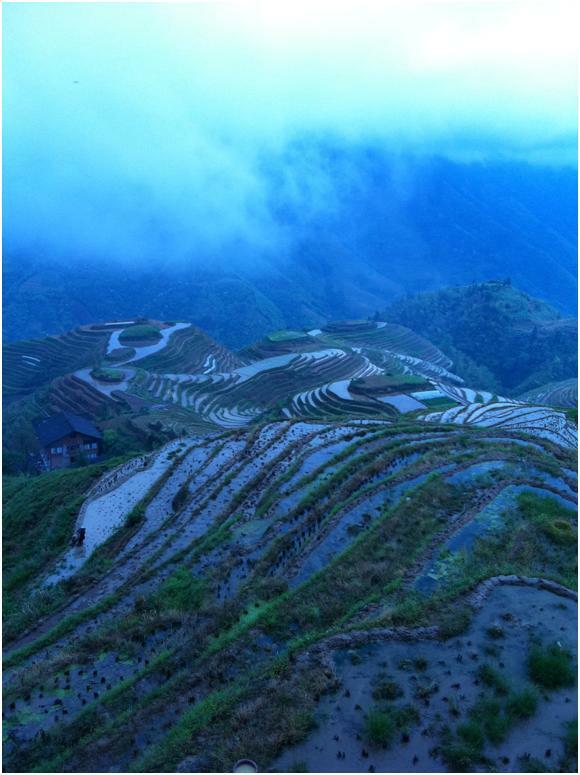 The rice terraces are an unbelievable site to be seen. We parceled out ¼ of our stash to have with our dinner. Wow! Neither of us could believe how wonderful rice could be. This rice has not been genetically modified and absolutely reflects the local terroir of Longsheng. It was creamy, alive with flavor and just a delight to eat. We kept the preparation quite simple. It was cooked gently in filtered water, and at the finish, we merely added a few dashes of sea salt and a handful of diced preserved lemon Susan had made. This rice made for yet another convincing argument for eating locally grown foods; and it is especially gratifying to have met the grower.